The Riverbank Arena comprises two pitches, one of which will be for warm ups. It is located in the north of the Olympic Park, which is built on the site of a series of revitalised canals through which the River Lea runs. The river is also the site of a number of settlements dating back to the Iron and Bronze ages. 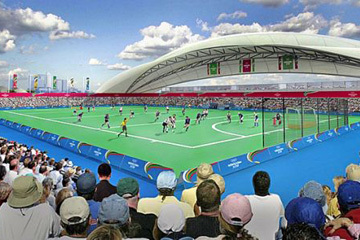 It will host Paralympic 5 and 7-a-side football, and after the Games the venue will be moved to the north of the Park. It will then be joined to the facilities at Eton Manor with 3,000 permanent seats and the capacity to increase this number for major events. 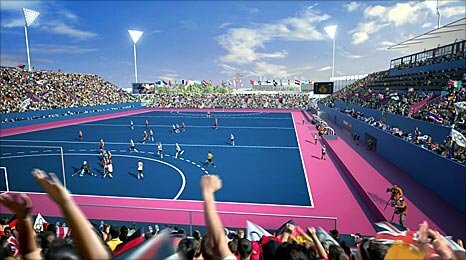 The London Organising Committee for the Olympic Games approved making the playing surface blue, whereas hockey is traditionally played on green surfaces, whilst the run off areas will be pink. All hockey games will be taking place at the venue, running from July 29 to August 11.